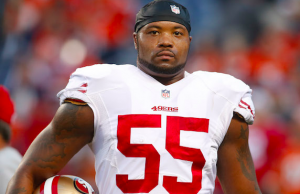 The San Francisco 49ers have parted ways with linebacker Ahmad Brooks. The team announced Friday that they have released the 33-year old Brooks. The move comes less than 48 hours before San Francisco’s third preseason game, which is Sunday night against the Vikings. Reports indicate that the 49ers gauged trade interest in Brooks before deciding to release him. Brooks had been with the 49ers since 2008. He spent the first two years of his career with the Cincinnati Bengals, the team that drafted him out of Virginia. He became a starter for the 49ers in 2011. Since then, he has been one of the most consistent performers on San Francisco’s defense. Had he remained with the 49ers this season, Brooks would have made $6.15 million against the salary cap in 2017. He was entering the final season of a six-year contract he signed with the 49ers prior to the 2012 season. Given his age, salary, and the fact that the 49ers are clearly in the midst of rebuilding under first year head coach Kyle Shanahan, it shouldn’t be too surprising that Brooks was let go. Brooks spent most of training camp battling for a starting spot with Eli Harold, a competition Harold has apparently won. Harold, who also went to Virginia, is just 23, 10 years younger than Brooks. He also came on strong the second half of the 2016 season, and at this point, possesses far more upside than Brooks. It now appears that 49ers middle linebacker NaVorro Bowman will have two new outside linebackers flanking him this season in Harold and rookie Reuben Foster. Foster is the favorite to start at weak-side linebacker with Malcolm Smith likely lost for the season due to a torn pectoral muscle. It’ll give San Francisco’s defense a new look from previous seasons when their linebackers were among the best in football. However, the 49ers are high on both Harold and Foster. As for Brooks, it’s unclear where his career goes from here. It’s been almost a decade since he was last without a job. For what it’s worth, Brooks missed only eight games in his eight seasons in San Francisco, so injuries have not been an issue for him, even in his 30s. He also accumulated 53 tackles and six sacks last season. It’d be shocking if he didn’t find a new home before the start of the season, although perhaps not in a starting role.